Mix rice flour, grated coconut and elaichi powder to the melted and strained jaggery and mix well. Add required amount of Ragi flour to get a batter of dosa consistency. Ensure there are no lumps. Heat a tava (Heating Plate) and pour a ladle full of the batter and spread it in the shape of dosa. Pour melted ghee (clarified Butter) or oil along the edges and cook on medium flame till both sides are well cooked. This can be served with a spoon of melted ghee spread on the dosa. Tips: When melting Jaggery ensure that the liquid does not boil for too long and make the syrup too thick. If the syrup is thick then the batter will stick to the tava and will not spread evenly. For those of you who love the taste of jackfruit, very finely chopped pieces of the fruit can be added to the batter to give a different flavor. But remember to chop the fruit very finely. Ragi which is also known as Millet is a miracle grain which has not received the importance that it richly deserves for its enriching qualities. It is rich in Iron, Calcium, Proteins and Minerals – more importantly rich in an essential amino acid called Methionine. It also abounds in Niacin which is a good source of B-Complex. It is absorbed easily by the body and is ideal for both the young and the old. It is considered to be a wholesome food for babies after they are 6 months old. Highly recommended for diabetics it is also very good for lactating mothers and women in general since it helps in strengthening bones keeping osteoporosis at bay. A dieter’s delight since it is low on fat and calories. And best part is it is inexpensive compared to Rice, Wheat or Dairy products and yet delivers much more than those. 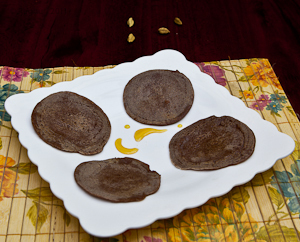 Given below is one of the easiest recipes that can be made from powdered Ragi. In heavy bottomed pan mix broken wheat, ragi powder, soya powder and water and mix well making sure there are no lumps. Place this vessel on the stove and stir continuously on high flame, till it comes to a boil. Lower the flame and stir continuously till it becomes thick in consistency. Add elaichi powder and milk. Add sugar or honey or any sweetening agent of your choice. Alternatively you can skip milk & elaichi powder and instead add butter milk and a pinch of salt and pepper. Tips – You may add powdered Fried gram or Pottukadalai for added nutrient value. 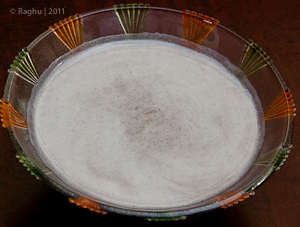 Some people add roasted and powdered peanuts [verkadalai powder] to the Ragi mix to give a different flavor. Ragi kanji had with a fruit in the morning for breakfast not only keeps your stomach full but also keeps you energetic and healthy.